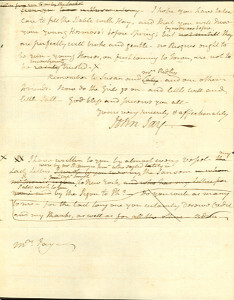 Autograph Letter Signed, three pages, quarto, London, October 2, 1794. To his wife Sally. 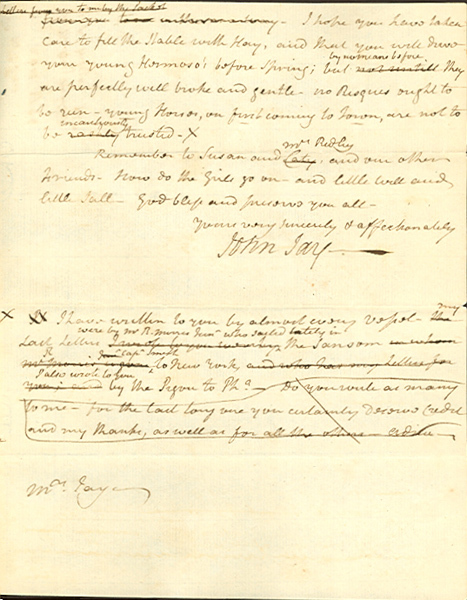 John Jay writes from London, where he was negotiating what became known as the Jay Treaty: “I was last week favd. with yours of the 2d. Augt. by Mr. McEvers. Had you not heretofore been in Europe and often experienced anxiety to hear from our Friends in America, you could not easily conceive how sollicitous I am to receive Letters from you, and how much pleasure I derive from being assured under your Hand, that you and our little ones and Friends are well. “From the monies you have advanced to Johnny Lyon, I should suppose the mills were nearly finished. The Stones purchased by Mr Green, I presume were Bur Stones, and intended to make the best Flour. Those mills ought to be proffitable. They will cost a considerable Sum before they are completed. I take it for granted that the Saw mill still remains to be done. Mr. Munro I suspect was too much employed in preparing for his Albany Journey to write to me. I have recd. one Letter from him since my arrival here. I am glad Mr. Grant has paid you more money than you know what to do with. As to stocks I should prefer Bank Stock. However I am not anxious, for on my Return I shall be able to employ usefully the little that will remain after paying what I owe. “I am much obliged by Mr Stewarts attention to your Request, and am persuaded that his work will meet with your approbation-make my Comp[limen]ts to him. I [received] his Request, but as yet have not had Leisure to do more. I shall [be] agreable to your Request. I will endeavour to find out where [Charles] is. He is not at Rome- This Letter will go by the Molly, Capt. Morgan to Ph[iladelphi]a. You might write to me a little Letter once a month by the Packet. I hope you have taken care to fill the Stable with Hay and that you will drive your young Hermes on before Spring; but by no means before. They are perfectly well broke and gentle-no Risques ought to be run-young Horses, on first coming to Town, are not to be incautiously trusted. Remember [me] to Susan and Mrs Ridley and our other Friend. How do the girls go on-and little Will and little Sall- God bless and preserve you all. In 1794 the United States faced its most important foreign crisis since the Revolution, and as Chief Justice, John Jay was selected by George Washington to negotiate a settlement with Great Britain concerning that country’s continued occupation of posts in the northwest, pending private debts to English creditors, and the British plunder of neutral American shipping during their hostilities with France. The importance to the young America of maintaining peace and financial stability was enormous, and Jay spent the summer of 1794 in London negotiating with Lord Grenville to reach an agreement. The result of his work, known as the Jay Treaty that was signed on November 19, created a system to settle financial claims between the two nations, provided for the removal of British troops from the Northwest territory, established commissions to settle boundary disputes on the northern frontier, and extended free trade and navigation guarantees to the English on the Mississippi River. The Treaty, however, aroused a storm of protest in the United States among the Jeffersonian Republicans, who denounced it as a sellout by pro-British Federalists. Mobs burned Jay in effigy, and opponents denounced him as a traitor. Before the negotiations, John Jay at one time had been considered a leading candidate to succeed Washington, but the unpopular treaty ruined whatever chances he had for the presidency. New York Federalists, however, elected him governor after his return from England. The “Stewart” mentioned in this letter is the painter Gilbert Stuart, famous for his portraits of George Washington (especially the unfinished one). In late 1792 or early 1793, Stuart returned to America from England. John Jay was the first American statesman of international reputation whom Stuart ever painted. The success of his likeness of the Chief Justice, painted in New York in 1794, introduced Stuart to an appreciative clientele in America. It is not surprising that John Jay needed to press Stuart in finish the portrait. Jay himself only had time to pose for the head. Stuart had a predilection for “nailing the head” and leaving the rest unfinished (“I copy the works of God and leave clothes to tailors and mantua-makers,” he once said). The issue was finally resolved by having Jay’s nephew model the judicial robe so that Stuart could complete the body.